Loss and damage of collagen and elastin (building blocks of the skin), blood vessels and pigment producing cells in the area affected. In addition, one also sees a loss of skin tone and wrinkle formation. Types of scars that, are initially red to purple in colour, and then, with time, gradually fade to a pale to white glistening colour. About 90% of pregnant women get stretch marks. They also affect 70% of young females and about 40% of young males. Heredity – Some individuals are genetically prone to stretch marks. Weight – Rapid weight gain or loss. Skin Type – Dryer skin types have less elasticity than oily skin so dry skin types are prone to stretch marks. Use of moisturiser regularly can prevent stretch marks in dry skin individuals. Pregnancy – it can result from the weight gain and hormone activity during pregnancy. Pregnant women (last months of pregnancy, on lower abdomen). Individuals that gain rapid or excessive weight. Individuals taking drugs containing steroids. Young women, on their breasts, thighs, hips and buttocks. In people who are generally more susceptible to stretch marks. Eating a well-balanced healthy diet rich in antioxidants, vitamins and minerals; drinking enough water and exercising regularly can help. Various creams and gels can be advised that help in lightening and blending of the stretch marks. RF Pixel laser, based on the RF-based technology, that resurfaces the skin, is a minimally invasive skin barrier breakthrough treatment for skin repair and aesthetic enhancement. Its synergy of technologies provides patients with a quick, easy and virtually pain-free answer to stretch marks. The RF Pixel uses micro-plasma technology to create multiple controlled micro-channels that reach beyond superficial layer of the skin, creating a local heat injury zone, leading to skin resurfacing by the lasers. The remaining tissue aids the healing and generation of new collagen. Eventually the irregular epidermal pigmentation is eliminated and collagen is formed, leading to smoothened and tightened skin and removal of stretch marks. RF Pixel enables doctors and aesthetic practitioners to obtain continuous and section by section skin resurfacing. It rolls across the skin, delivering the laser pulses easily with no discomfort. Depth of skin resurfacing varies with energy output and can reach up to several hundred microns, while the controlled spacing between pixels minimizes the damage on the treatment area, thereby strengthening collagen as well as reducing patient downtime. 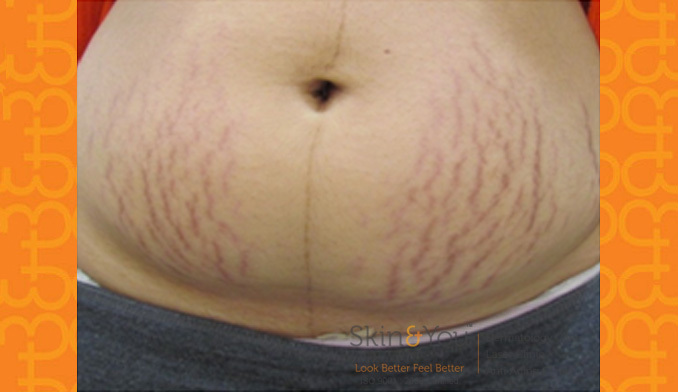 Why Skin & You Clinic for Stretch Mark Removal? Skin & You Clinic, Mumbai, has the latest technology in stretch mark removal that can rapidly treat large areas without the limitations of older technologies. The unique RF pixel treatment is safe, has reduced downtime and minimal side effects. We specialize in stretch mark removal obtaining almost a 60- 75 % reduction following treatment.